Social Media Does Not Equal Inbound Marketing | New PR Words - and Music! Social media engagement is one important part of implementing Inbound Marketing, but to really make social media pay off, you first have to understand its purpose in the big picture. Identifying people online who can buy your products/services or refer others who can. Cultivating relationships with those individuals. Publicizing your website, blog posts and other valuable original content to drive traffic. Providing outposts for your company other than your website to engage with audiences in different ways. Originates from a more strategic than tactical mindset. Looks at marketing as a driver of growth and takes business objectives and metrics into consideration. Is concerned with not only creating online traffic but converting it to sales. Tailors tactics to address a prospect’s progress in the purchase cycle. Incorporates analytics to measure success and set productive marketing directions. So if your company has a Facebook page, a Twitter, LinkedIn and/or Google+ account – even if you’re blogging like crazy in addition to your social media efforts – and you’re not sure what it’s actually contributing to the bottom line, it’s time to graduate to the next level of online marketing. 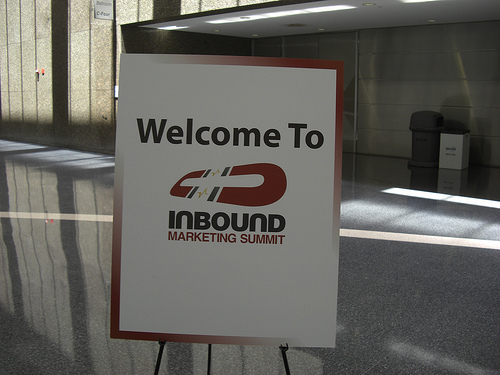 Start thinking and implementing like an Inbound Marketer. Many people I’ve met have not even reached the basic level of understanding – one said to me recently, we do social media – I had a look – their Twitter account just has the name and website – they have 4 followers. On youtube, they have some videos, none are indexed or described. It is a moderately sized company, so they don’t have the one man band excuse. The assumption seems to be that if we have an id on Twitter, people will beat a path to our door. Peter, thanks for adding your experience. Where I see the downfall of many businesses in online marketing is a lack of understanding of how it can help reach business objectives. It’s a failure of strategic planning. That’s why tactical implementation is so often anemic and without results. You rock! (literally and figuratively) Follow Peter on Twitter @academyofrock or read his blog http://www.academyofrock.com for astute rock ‘n roll metaphors that address business management issues. A fun way to learn how to manage!! !